With its animalistic attitude and emerald green eyes, the Cartier Panthere Head Ring will give you confidence the second you slide it onto your finger. 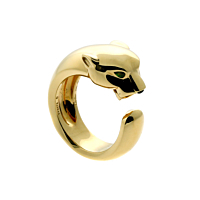 The panther's ears are tipped back showing its growly side while the ring's gentle curves establish its elegance. 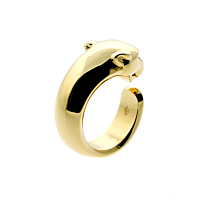 Made from 18-karat yellow gold and formed to curve protectively around your digit, the Cartier Panthere Head Ring is as eye-catching as it is formidable.